and Next Bus which allow users to obtain bus arrival time. Streetdirectory iPhone Map of Singapore also offers pre-loaded maps for major cities which can be use without internet connection. iPhone Map of Singapore enable users to do search to find locations of Places, Buildings, Businesses, and many other categories. Simply tap "Search" and type the keywords such as Postal code, Street name, Building name, Block Number and so on. Click on search results view it on our map app. 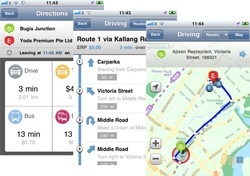 You now able to plan your journey better with one of our feature called Direction and Next Bus. Review your route and get your iPhone navigation for Driving, Taxi, Bus, or MRT journey using Directions, and find out when your next bus is coming through our Bus Arrival Feature. Direction will use GPS location to travel from users current location. 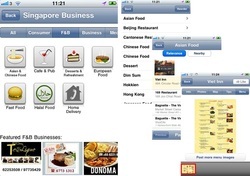 Tap "Business" on our iPhone Map of SIngapore application to get categories information such as Info, Photos, Map, Tips, and Menu. Search landmark to get all the businesses in side or search for busi ness name directly. 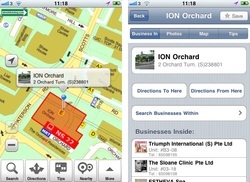 Need to bookmark your favourite business, lo cation, or iPhone navigation route? This application will help you organize those. Simply tap Like or Save and you will be able to view or manage your Favourites anytime. 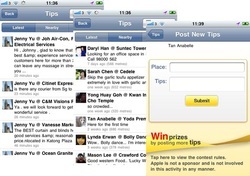 Another feature from our iPhone Map of Singapore is Tips. Tap "Tips" to post and view tips from all over the places. Turn on your GPS to retrieve nearby tips. Tap "New Tips" to post new tips, then type Business or Place name and start shouting tips.